Alshaya has unveiled a dazzling array of new shopping, dining, and entertainment brands at The Avenues Phase IV in Kuwait, which opened its doors this week. The highlight is the opening of 11 brands in Kuwait for the first time, offering Alshaya customers an even greater choice of shopping and dining experiences – and even more opportunities for exclusive rewards and prize draw entries through the Privileges Club. Makeup and beauty lovers will be spoilt for choice with a wide range of innovative makeup brands to discover, including the first NYX store in Kuwait, the debut for Korean beauty brand Etude House, and first appearances for Tromborg’s range of organic beauty and skincare products and boutique handcrafted fragrances brand Le Labo. Lovers of Italian food and pizza can visit 400 Gradi, an authentic Italian restaurant offering traditional Neapolitan pizza cooked in a 400-degree oven, and a delicious range of Italian cuisine; while Blaze Pizza delivers exceptional quality pizza at lightning-fast speed. Fresh out of Hollywood and making its Middle East debut is Cleo, a Mediterranean-inspired restaurant, which features delicious shareable plates, mezzes, flatbreads and cocktails. Fashion brands Monki and & Other Stories, part of the H&M group, are both new to Kuwait, offering unique blends of styles with bespoke collections that range from preppy chic to simple ready-to-wear for the season. Some of the world’s best-loved brands hit new heights. The largest Debenhams store outside the UK stretches over three floors and offers a total of 150 brands, including 40 fashion and 20 cosmetics brands new to Debenhams in Kuwait. The flagship store features a unique design and includes beauty treatment rooms for personalised service, a niche fragrance area with new-to-market brands, and full assortment counters for Tom Ford, Huda Beauty and Urban Decay. Expanded fashion ranges include new designer accessories and lingerie brands, such as Jennifer Lopez and Heidi Klum, with many exciting new European women’s and kids clothing brands entering the market for the first time. H&M’s stunning new flagship store will offer customers an unprecedented range of ladies, kids, men, beauty and home collections in one location, with a new elevated shopping experience across two floors. The new The Body Shop store – the largest in Kuwait – features a new design concept, with a VIP make-up room. Bath & Body Works will also have a new interior design concept, whilst the Starbucks’ Reserve Bar concept comes to The Avenues for the first time. The country’s first Aveda combined retail store, salon and treatment centre will be a go-to destination for those who want to look and feel fabulous, offering a range of haircare and beauty products created using organic raw herbal ingredients and organic essential oils. 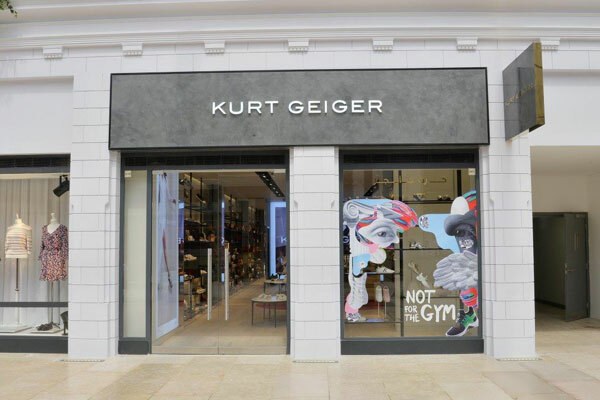 Phase Eight, which gets its own store, delights with its stylish and beautiful range of evening and party wear, while glamour and elegance hit a high note with Kurt Geiger’s signature stilettos, footwear and accessories, worn by celebrities like Kendall Jenner, Angelina Jolie and Sienna Miller. Iconic beauty and cosmetics brand Clinique also gets its own store for the first time in Kuwait. There’s more to come even after opening week. Visitors can look out for Italian pizza brand Spontini, straight from Milan and made with its original 1953 recipe; and, those seeking exciting new entertainment ideas will love Tek Zone, a new virtual reality entertainment concept for the whole family, opening later this year. & Other Stories’ first store in Kuwait unveils a new collection of favourite pieces that includes a wide range of shoes, bags, accessories, stationery, beauty and ready-to-wear fashion. The & Other Stories brand has great attention to detail and quality and offers everything a woman can wear - such as shoes, bags, accessories, beauty, stationery and ready-to-wear - enabling them to create their personal style or story. 400 Gradi offers an authentic Italian dining experience and is the brainchild of Australian chef Johnny di Francesco, who has won awards for the world’s best pizza. The restaurant takes its name from the temperature of the ovens, in which the signature pizzas are baked at 400 degrees. Look out for the stunning ovens visible in store. Blaze Pizza serves up affordable and quick ready-to-eat pizzas cooked in a blazing hot open-flame oven in just 180 seconds. Each Blaze Pizza restaurant features an interactive open-kitchen format that allows guests to customise one of the menu's signature pizzas or create their own, choosing from a wide selection of fresh, artisanal ingredients. Named one of the US’s 50 hottest restaurants, Cleo is a Mediterranean restaurant infused with Hollywood glamour as masterminded by its award-winning Chef Dany Elmaleh, which offers a feast of Mediterranean cuisine unlike any other. Discover a sophisticated, yet simple and flavourful menu, with a convivial, shared-plates ethos. Etude House, the No 1 Korean beauty brand, makes its debut in Kuwait, bringing Asian beauty to the region and offering customers a fun, happy and romantic makeup experience. Its store aims to create a culture of ‘makeup play’ in its stores, with feminine, playful products. Le Labo is a New York-based perfume house that has become iconic for its collection of handmade perfumes and home scents, available in a limited number of stores and labs around the world. It offers men and women exclusive 100 percent vegan fragrances, perfume oils and soy-based wax candles. Monki’s first store in the country showcases the Monki World, leading customers into a fantasy universe that has inspired all stores worldwide. New features exclusively created for the Kuwait store include a sky of glowing clouds, a rotating turbine flower display and a shoe-heaven carousel. At its core is the Swedish fashion brand’s aim to empower young women everywhere to express and feel great about themselves. NYX offers makeup lovers more than 2,000 affordable professional makeup products, in a vast range of colours and shades. The unique professional range, continuously infused with bold trendy collections and a brave digital community, are hallmarks of NYX Professional Makeup.